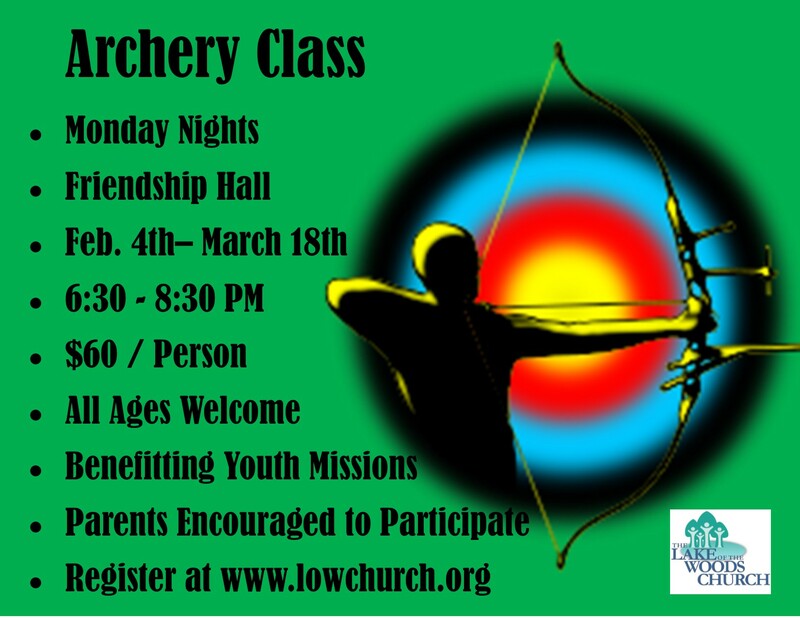 2019 Archery Class Registration Monday's February 4th - March 18th 6:30 - 8:30 p.m. Please make checks payable to: The Lake of the Woods Church and write Youth Missions in the memo line. Church information and updates for ongoing activities and special events are sent via email through Constant Contact. If you would like to receive this information in the future, please check the box below. I, as the registered am 18 or over, or I am a parent or legal guardian of the registered who is currently under the age of 18, grant permission for the registered student to attend The Lake of the Woods Church Youth Archery Class and consent to its Discipline Policy and also do hereby release The Lake of the Wood Church, its Staff and Volunteer Leaders/teachers from any and all liability or responsibility due to any injury that he/she/I may incur as the result of, or arising in any way from participation in activities at or under the direction of The Lake of the Woods Church. I am fully aware and consent to accept these risks and voluntarily agree to allow his/her participation in activities. If I cannot be consulted in an emergency, I hereby give permission to the physician selected by a representative of The Lake of the Woods Church to hospitalize, secure treatment for, and to order injections, anesthesia, and/or surgery for the person named above. I understand that The Lake of the Woods Church only carries secondary insurance and that I will take primary responsibility for any fees or charges at any clinic, facility, or hospital arising from treatment of injury or illness. I furthermore understand The Lake of the Woods Church often takes photographs or videos of participants during its activities or events. I grant permission without compensation that these photographs or videos may be used in publications, presentations, websites or promotion of The Lake of the Woods Church.